We are located in Galway on the West coast of Ireland, and our team has a vast knowledge of Ireland. The team are immersed in the unique landscape and history of the Burren, the wild beauty of Connemara, and all the other areas along the Wild Atlantic Way from Limerick to Donegal. This gives us an in-depth knowledge about all the minor details that will make your bike tour in Ireland a memorable experience. There are a number of important elements that have to go into the set-up and running of a bike tour. We make sure that your bike trip will run without any glitches. 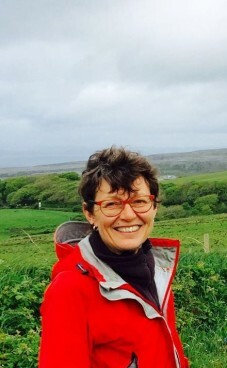 Wilma Heim, founder of Green Marble Tours, has been designing, organising and guiding cycling trips in Ireland since 1995. A German native, she came to Ireland as a student in 1990 – and never left (!) considering Ireland home and she is frequently told that she is more Irish than the Irish themselves. With her German genes comes a high esteem for quality and the business is built around this. At the core of what we do are the highest standards in all areas of organising a bike tour. Bicycles, accommodations, service, route materials and more are of unparalleled quality. With over 20 years’ experience in leading trips, we have an outstanding team of guides and professional bicycle mechanics, ensuring your bike trip will be most memorable. Green Marble Cycle Tours was founded with the notion that bike tours should emphasize great biking along outstanding scenic spots rather than notching off all the “must-see” sites. Along the way we will bring or point you to some of the hidden treasures of Ireland. There are some phenomenal quiet and interesting sites along the more hidden corners and biking in Ireland will be a trip of a lifetime.